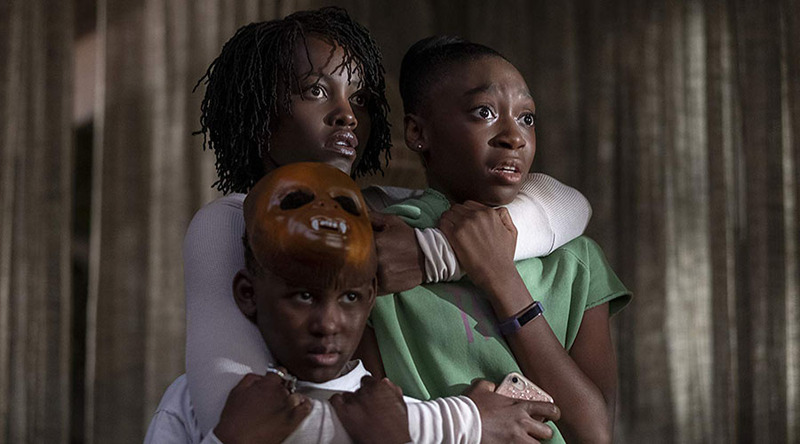 Writer/director/producer Jordan Peele returns to fill us with fright and leave behind some food for thought with his new work, Us. Set in the summer in sun drenched California this time, the terror the Wilson family has to endure while on holiday is anything but sunny. Life is good for the Wilson clan, so good in fact, they can afford to rent an expensive lakeside house to get away from it all. As they settle into their new digs, each family member shows their own unique personality. Everyone seems happy but Ma Adelaide (Lupita Nyong’o) seems to be quite fragile. She’s had a traumatic experience as a youth and it still colours her actions even in adulthood. Husband Gabe (Winston Duke) tries his best to counter this mood by being a bit goofy and less than serious most of the time. Their two children exist in their own little worlds, one buried in their phone, the other with head in the clouds. This calm changes dramatically when a strange family parks themselves in the shadows at the end of the driveway. This starts a chain of events that will push the Wilsons to the edge of their sanity. There is always subtext in Peele’s movies and Us is no different but it’s difficult to expand on that without giving important details away. So I’ll leave you with just one clue, this wayward family might have to learn to slay together, to stay together.